It’s no secret: An electric toothbrush is a very convenient device to use during your oral care routine. However, after some time the battery may need to be replaced. This may be because it’s exhausted its battery life or it’s simply faulty. Unscrew the bottom part of your Oral B Toothbrush. This is done by turning it counter clockwise. However note: A bit of force might be necessary to break the seal but too much will crack the plastic casing, so be careful. Pull the cover off carefully to expose the battery. Bend the metal contact away from the battery to remove it from the casing. Make sure you take note of the original position of the battery you’re removing so you can replace it in an exact manner. Re-bend the contact into place. Make sure you don’t over bend it. This might break the contact rendering the toothbrush useless. Replace the bottom part you removed in step one to cover the battery. Twist it in a clockwise direction until the handle is completely screwed on. READ MORE: Recommended Oral-B 1000 Electric Toothbrush. Of course, Oral B has a few unique devices, and not all work exactly the same. Therefore, there are different batteries for different Oral B Toothbrushes. First off there’s a battery-powered toothbrush mentioned above, which features built-in AA batteries. Secondly, you may opt for the rechargeable electric toothbrush. With this type, you need to plug it into the wall to recharge. Is There a Difference in the Battery Replacement Processes? There’s a slight difference in their battery replacement process. 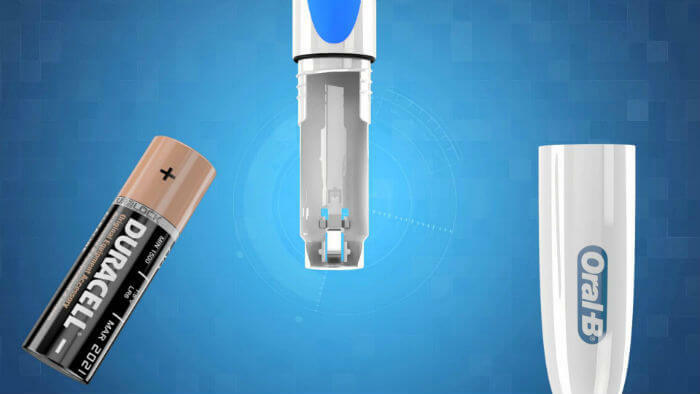 The rechargeable toothbrushes are more complicated because of more advanced components. Now you’re prepared no matter which one you have in your bathroom. If you have more questions, do not hesitate to comment below. Just what I need to know. Thanks!